I’ve been sitting on this for as long as I can, but it’s finally time to pull back the curtain! Book 3 of The Cleaners is arriving this April, with a planned pre-launch during Emerald City Comic Con (so, if you’re in the Seattle area, I hope you’re planning to attend). The Dustpan Cometh will be published by WordFire Press, continuing the story of the supernatural sanitation company, the Cleaners, as its staff of janitors, maids, plumbers, and more battle the forces of Corruption in all manner of mucky and murky forms. For those unfamiliar with the series so far, you still have time to check out Enter the Janitor and The Maids of Wrath before this one becomes available. So, without further ado, I present the final cover! The cover art is by Jeff Herndon, who did the amazing covers for the first two books, and continues to bring what I think is a fun and unique style to the series! The extra cover elements were designed by Janet McDonald, via WordFire Press. It’s back to school for Dani, whose new work-study position as a—what else?—janitor at her college provides the perfect front for her job with the Cleaners, the supernatural sanitation company keeping reality tidy and safe. The toughest part? Accepting that the forces of Corruption aren’t behind every squicky mess. Sometimes frat boy vomit is just frat boy vomit. Then a real problem appears: Sydney, the entropy-wielding Scum whose touch turns anything to dust. He reminds her of the deal she made so he’d spare a child’s life, and it’s time to uphold her side of the bargain—by going on a date with him. In the midst of the pair’s respective dilemmas, a strange form of Corruption strikes in the heart of Denver, transforming swaths of neighborhood parks into lifeless desert. Wearing a dress in public. Like the first two, The Dustpan Cometh will be available via Amazon and most other major online retailers in both paperback and e-book format, and hopefully should have an audiobook coming out this year as well. If you are able to attend ECCC, that might give you the best chance to get the earliest available copies of it (plus, you can get it signed). And I should have some review copies, both digital and print, available soon. I’m excited to see the series continue, and I hope you are, too. Thanks to all my readers for supporting The Cleaners, and here’s to the ongoing adventure! 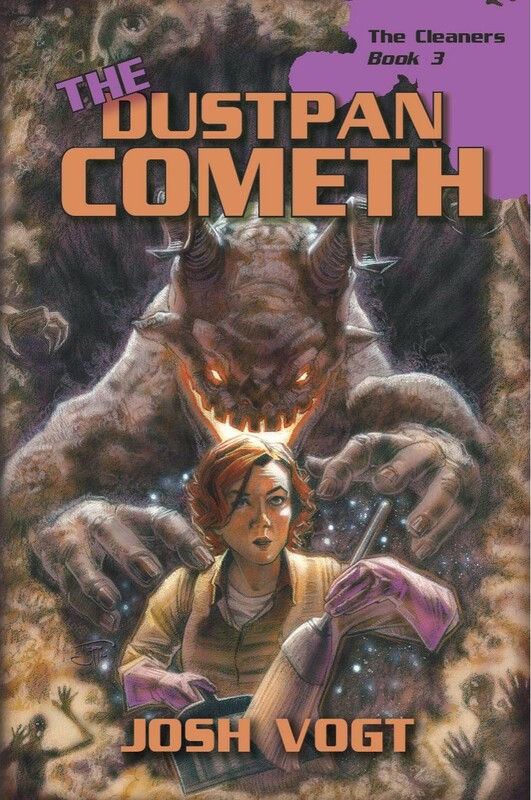 The Dustpan Cometh is a June cover competition contender! Previous Post Come on down to OryCon!